This first one is the type that came on my '99 X-31 - rip and joiner fence back to back, with a Long Bar mounting - which gets in the way when ripping shorter stuff. 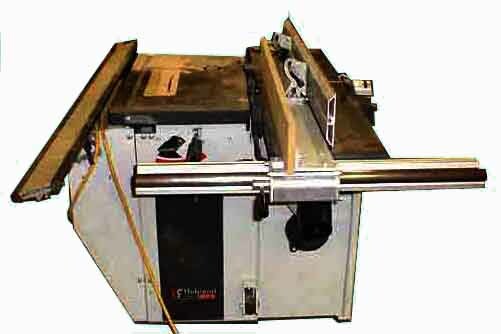 The "sticking way out in front of the table saw" does give you more fence IN FRONT OF THE SAW BLADE - which is a good thing - the part well registered against the fence BEFORE it gets to the front saw teeth. 1. 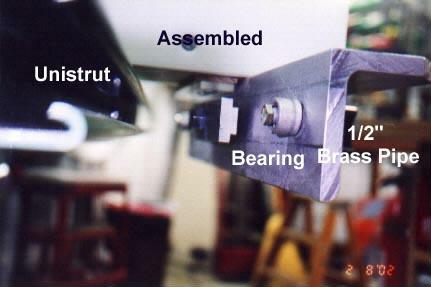 The combined Rip and Jointer Fence is moderately heavy and though Robland provided a lifting handle on the jointer's angling "thing" - it's back a ways - meaning you have to lean over the machine to get use it to swing the fences up, pivoting off the support bar end - to get the fences off the machine. NOT GOOD if you already have a bad back or don't want to have a bad back. 3. 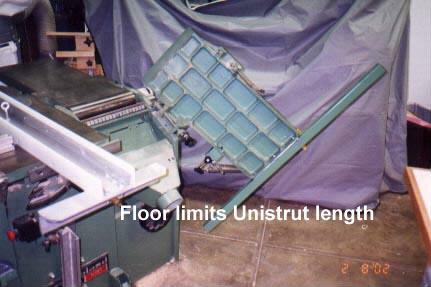 In order to use the planer you must swing the jointer's infeed and outfeed tables out of the way so the dust collector shroud can be flipped for Planing Mode. The left end of the fence support bar then is sticking up in the air which makes getting around to the back of the machine to retirieve a planed part a PITA, especially if you don't have a lot of room to the right of the machine - which I personally don't have. 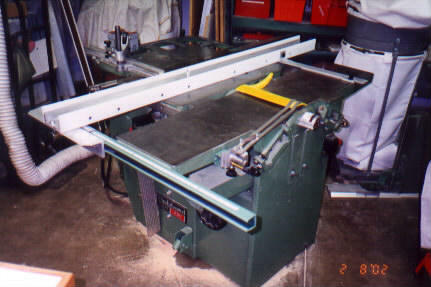 This next one was/is referred to as the Knapp fence - the one shown here is the jointer fence. 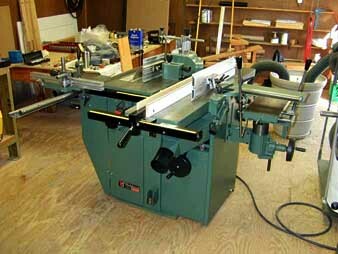 The rip fence looks similar and mounts on a rectangular bar attached to the end of the jointer's outfeed table and another mounted to the infeed side of the saw / shaper table. 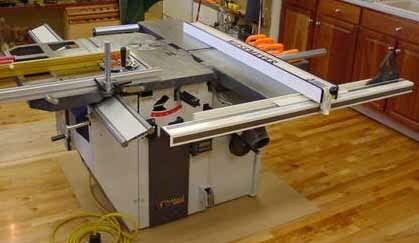 You can see the jointer outfeed table mounting bar in the photos below. 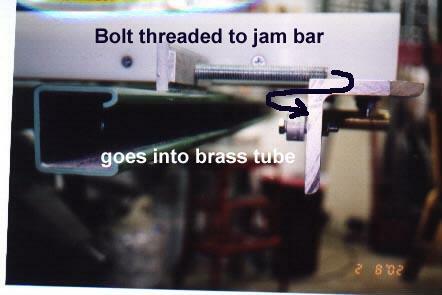 I don't recall if the rip fence allows for tilting as the jointer fence does. 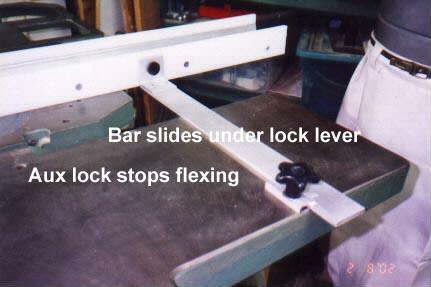 For the DIYers - here's one - the Koblosh Fence which uses a sliding door's overhead track. 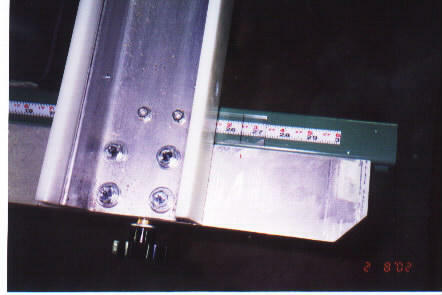 Has the same problem as all the fences that attach to a single mounting bar on the end of the jointer's outfeed table. 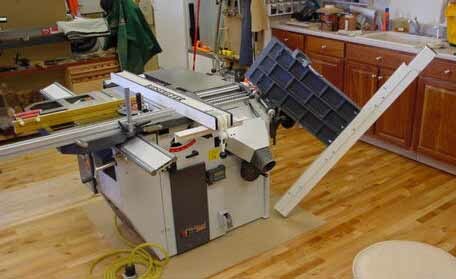 Has the same problem with "opening" the jointer tables for planing.